I was skeptical to try Bernini after reading reviews of disgruntled Yelpers. I knew they specialized in high-end Italian, but Yelpers said they were appalled at the high-end, nose-up attitudes the staff had there. I really like to enjoy my meals, and not have to be bothered with a sassy waiter or waitress. Though I boycotted this place for awhile, I finally gave in after seeing my friend, Rayna's facebook pics. The food looked delicious- pizza with truffle oil and honey, pasta with uni, colorful fruity desserts...I had to give in!! So, there we were, Joe and I, in Bernini on a Saturday Night. It wasn't too crowded but there were a lot of couples drinking wine and having pizza. That seemed like the norm. It also seemed like the practical thing to do with Bernini's pizza costing about $20 a pop! This is about 3 slices per 2 people. I honestly wanted to try ALL of their pizza, but had an emergency phone call. We ended the night with one Norcia Pizza (mushrooms, sausage, mozzarella, walnuts and truffle oil), and had to run. What a wonderful combination that pizza was! I'm not a big fan of walnuts, but they drizzled the right amount on top. It was perfect, especially with their equally crunch and thin crust. A big winner. Next time, I'm up for another Norcia Pizza, their Fransescana (mozzarella, mushrooms and prociutto), and their Quatoro Formaggi (mozzarella, asiago, gorgonzola, and parmiggiano drizzled with honey!!!). I'll also have a glass of their Meiomi. 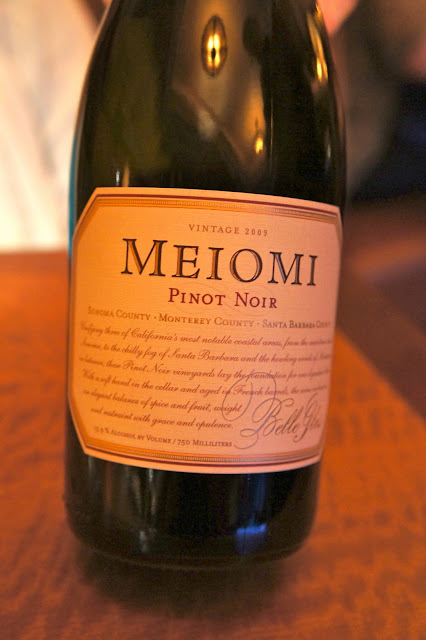 It was a nice surprise to see this wine on the menu, as I had first had it in Sedona, Arizona this past July! It's a great Pinot Noir. Highly recommended! FYI, they are open Tues-Sunday 530-11pm. Last order is 1030pm. Two LITTLE pieces of bread. That's it?! Norcia Pizza. Took about 20 minutes! To drizzle on the pizza. This pic is from my Sedona trip! Yummy! The hubby loves pizza. I swear he could live off that stuff. hehe.